I have been active on 4m on and off for many years. I have recently put up my elderly homebrew NBS 5 element yagi at 30' on a pump up mast. This has enabled me to join in the DX fun on 4m, working OZ, G, and ON (Xband to 6m) in the first few days. JT6M was used for these Meteor Scatter QSOs. The Es season meant that most of europe was in range for much of the time and on a number of days the 70MHz Broadcast from the Ukraine and beyond were very strong. First GM to OH, OH2BGD 15/12/09 @10:40 MS. Listen to the fantastic JT6M burst received by meteor scatter from Arto in this QSO. To decode you will need WSJT (6 or 7) software. The minimal modifications done to the A200 are below along with the A200 circuit diagram and board layout. The filter for 6m had to be rebuilt with a new coil in each section (about 10 turns) and re-tuned. Maybe more details next time it is in bits! 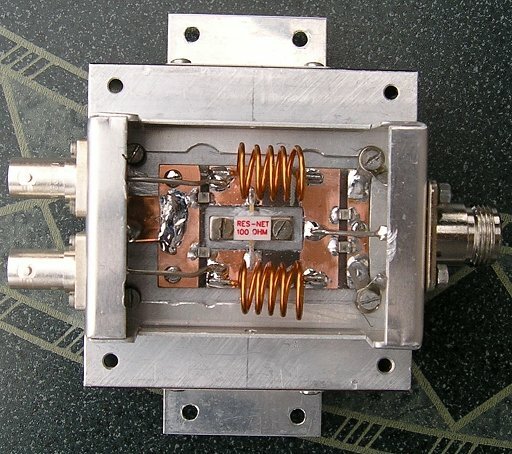 The A200 E0 version covers 68-88 MHz unmodified and can be run with no more than a tune up. However, to get the most from this. Note the amp runs on 12V DC despite the colours of the power cable. DO NOT plug into the mains! I have fitted a preamp and made a couple of changes to the bias cct, which got a little warm, and was not as low impedance as it could be. The bias cct is far from optimal, as it uses diodes thermally connected to the power devices to set the bias voltage. There are much better ways of doing this that will produce better intermodulation products. G3SEKs pages have some good info on alternatives. The mods are shown on the images below. 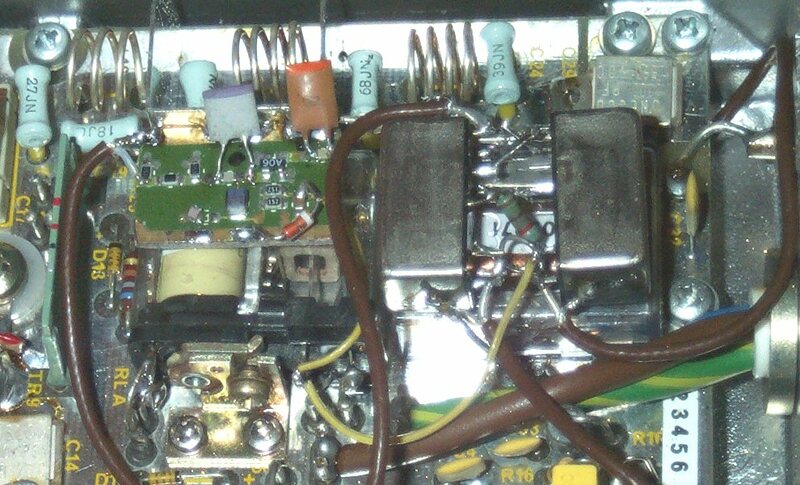 The preamp is simply a MAR6 and a couple of relays, wired in the receive path. When the unit is not powered, the relays allow RF through. 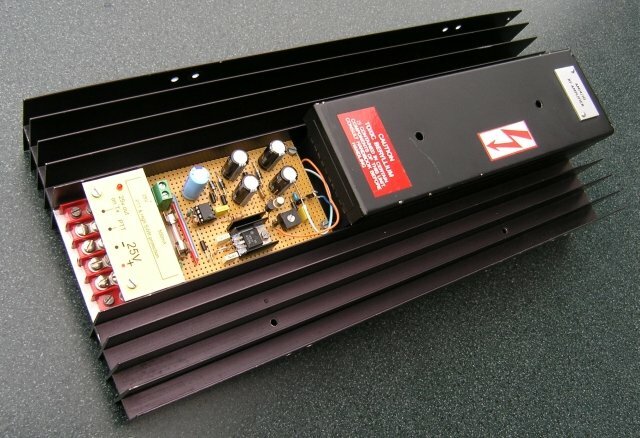 Alastair GM3NKG has engineered a nice amplifier using a pair of the AM14/10 amplifiers. 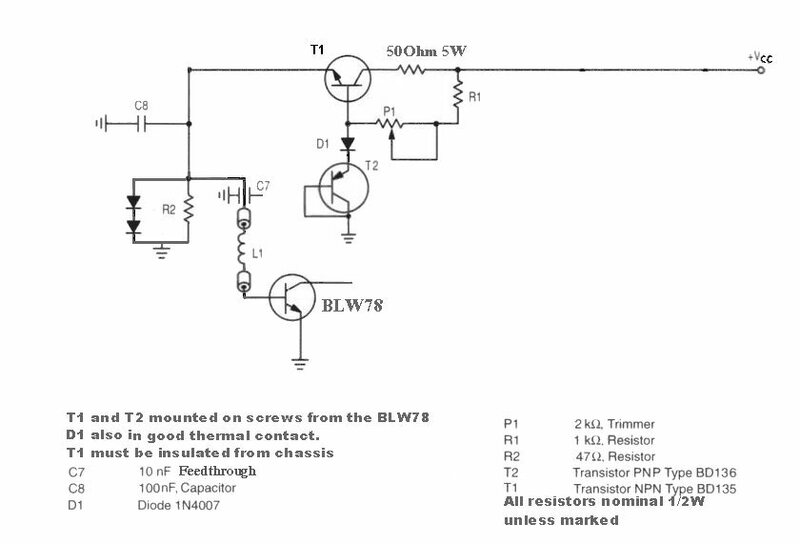 Using Wilkinson combiners, this is capable of generating a comfortable 190W, which after filtering and coax losses gives 160w at the antenna. No forced air cooling has proved necessary, despite long periods of operation on JT6M. A business trip this year allowed me to spend a couple of days on Jersey. I was able to arrange this to cover the peak of the Perseids meteor shower. Alastair GM3NKG lent me his lightweigth 3 element yagi, and David GM6BIG provided a lightweight 15A switched mode PSU. All this had to be compact as baggage allowances on airlines are not generous. Dennis GJ3YHU also offered me the use of his old 5el yagi, which was at the Fremont point TV transmitter, though it was not used in the end because the match was poor. Operation was from the kitchen in the transmitter building (IN89WG) with the antenna about 60 feet from ground level, looking over the sea to the North. After setting up, a quick phonecall to Alastair GM3NKG resulted in a rapid MS QSO, and a spot on the OK4KST chat. This resulted in a rapid pile-up on SSB. Tropo conditions seemed about normal, but the excellent site produced reliable signals as far as G4DEZ to the North East, and the Manchester area with ease. Some of these QSOs were over 460km. Not bad for 50W to 3el.